I remember when I took my first-born baby to the pediatrician for his first checkup 40 years ago. Like most young Moms, I looked up to my pediatrician and completely trusted him. I did everything he told me to do, never questioning his expertise or doubting him, believing that he would never recommend or do anything that would put my baby in harm’s way. Much has changed since 1978. Back then infants and children were getting half as many vaccines as they do today. Parents had no information at all about vaccine risks and failures. We just followed the doctor’s orders. Today, the subject of vaccination is the most often discussed health topic in America. Not a day goes by without mothers and fathers being reminded that the health of the nation depends upon making sure their children get every one of the 69 doses of 16 CDC recommended vaccines exactly on schedule. 13 Responses to "Pediatricians Turn Well Baby Checkups Into Vaccine Battlegrounds"
Building an Empire on Stolen Insurance Claims. Yes, well in the ’50’s the trusted doctors were aggressively encouraging moms to give newborns indigestible soy milk of questionable source and dubious, if not harmful, ingredients so moms who could breastfeed wouldn’t have to. I say follow the money, always. I was a casualty of that idiotic suggestion– and years later a victim of some unknown vaccine injection during a school day that even my parents were not informed about. I saw an article that Robert Kennedy, Jr., has succeeded in court re vaccines.Maybe the full law including testing & safety will eventually be implemented. I don’t hold out hope for that. The agenda is promulgated and sustained by powerful people who have nothing but time and money. Most “laws” exist to protect them, not us. Besides which, those in the judiciary, by and large, are beholding to governmental and non-government organizations over and above the public. That’s why the majority of those in the judiciary are in those positions in the first place. They’re beholding to the “bar” association, to political machines which help to get them elected, to secret societies, etc. And why does RFK Jr. basically rail against mercury and not much else? The vaccines have multiple toxicities and eugenic effects. NVIC does a better job of informing the public as to what goes on. The very concept of vaccination is absurd. If the medical industry really understands disease then why are Americans the sickest population in the industrialized countries. We rank first in infant mortality. Healthy people don’t go to doctors. How can a physician make his financial obligations for his/her luxurious life styles without a steady stream of sick patients streaming through their patient mills? Ascorbic acid, i.e., Vitamin C cures just about all diseases when the dosages are high enough.The best route being IV. When my son was born 42 yrs. ago ——after his second round of Vaccines (a whole lot less then – than now) – he had Severe Reactions. My Pediatrician said ….”no more”. He explained to me why – God Bless him. I later learned the true ingredients of all vaccines……disturbing to say the least. My son never got another one……we were able to “opt out”…so to speak with a simple form. He got some of the normal children “diseases” – survived all and has been a very healthy. This was my Start to becoming a Natural Health Counselor – 34 yrs. now – and keep Educating. Unfortunately my grandchildren don’t get that option. But their pediatrician has allowed them to space out the number of vaccines at one time. There is a very effective homeopathic to be given before & after vaccines to help with all side effects. This is the same for our animals too. It’s all about the Money to Doctors & Vaccine Companies….so sad. And it isn’t “sad”. We should start using the correct terminology when referring to those people and agendas which wish to do us harm. It is CRIMINAL and deserves punishment. 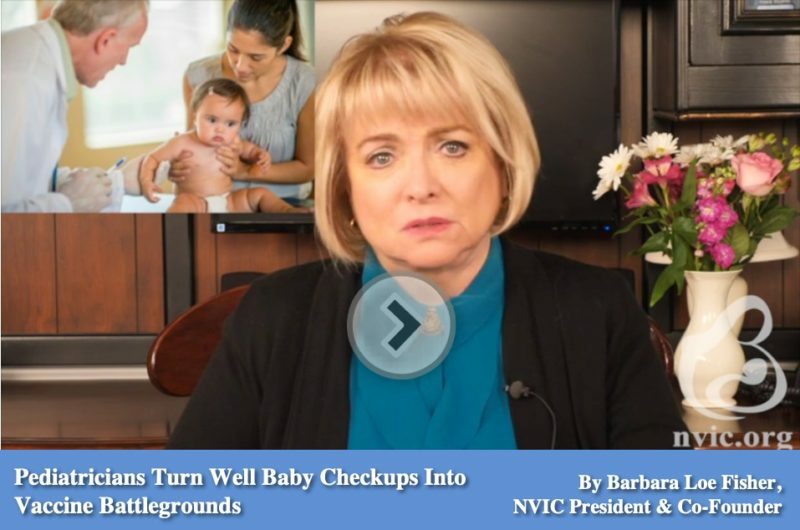 WHY bother taking your children to “well baby” check-ups. The WHOLE IDEA is absurd and was ONLY pushed out into public consciousness in the late 1970s and early 1980s because the GAME PLAN was to start pushing more and more vaccines on the public, but especially for the children and those in charge of the agenda needed buy-in from parents. So the whole “well baby check-up” scam was started. WHY should any child see a doctor if he/she isn’t sick? And I mean REALLY sick…not just the sniffles and low temperature. Viruses need to resolve them selves with proper care at home. The body CAN and DOES heal WITHOUT constant intervention. Read Dr. Robert Mendelsohn’s books. He died in 1988 but his books are still available. Of course, they called Mendelsohn a quack, so you know those in power don’t want you to read his stuff. That expression “doctor’s orders” …..hey, I didn’t sign up for the military and even if I had been in or were currently in the military, I’d never go along to get along , especially when it comes to following someone else’s ideas about my body or my children’s body. Drop dead. SO, to avoid the “trauma” of standing up for yourself or your children, AVOID the ‘well-baby’ visits. They are UNNECESSARY at best and DETRIMENTAL and POTENTIALLY LIFE-THREATENING, at the worst. Do you really care how tall your child is–or how much he/she weighs? Can you not determine that on your own, in the privacy of your home? As a parent, WHY are you not qualified to know if and when your child needs to see a doctor? Are you unable to read information on your own and/or speak to older people in your life who’ve gone through child rearing? GET OVER the idea that people with letters after their names have a better handle on what is going on with your children than you do. ALL doctors are AGENTS OF THE STATE, if they are taking “insurance” because they MUST go along with the insurance industry AND the state — which is IN BED with the insurance industry because they can lose their “License” to “practice”. ENOUGH IS ENOUGH. FIGHT BACK. When we were young only the Small Pox shot was allowed and nothing more. Then when a flood area was close to our home, we had tetanus shots. Babies bodies are not made to handle these chemicals and yet today there are shots from 69 to 72 in babies/toddlers while brains are not completely developed and the brain is affected by everything. Since I am in Integrated medicine, I have to get a tetanus every 10 yrs. No problem, but I actually had to tell Kaiser I did not want all the crap they inject to our little ones but just the one. My primary arranged for just the one tetanus shot! Since when did any chemicals in foods, shots, or items used in homes and on yards get to be safe? NEVER! When I returned from living/working in a 3rd world country, I sought out true non-chemical cleaners and that even to today are Shaklee cleaning/laundering products. No danger of inhaling, washing clothes, or even fires, and little ones drinking the liquid chemicals. We can no longer trust any health organization and doctors in general are not well educated about all this crap in today’s world.